Senator Corey Booker will testify against his colleague in an unprecedented move by Democrats. This is the first time in history that a sitting senator will testify against another sitting senator for a Cabinet post during a confirmation. Senator Jeff Sessions desegregated schools in Alabama and took on the KKK in the state. Democrats are desperate to stop the Alabama Senator’s confirmation. 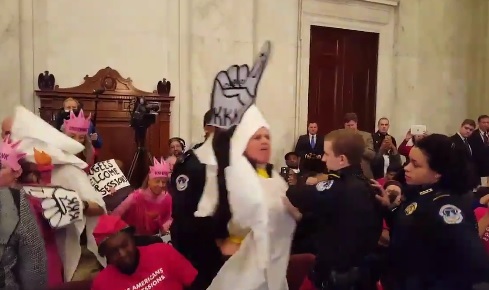 This morning Code Pink activists greeted Senator Sessions dressed as KKK members. They heckled Sessions as he entered the room this morning. The Code Pink protesters heckled Senator Sessions as he entered the room today. Code Pink activists are still sitting in the hearing room. Code Pink planned ahead for this hearing.